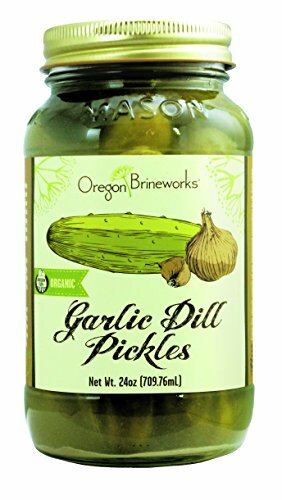 Do you need your daily pickle fix, plus enough garlic to keep those bothersome vampires at bay? Look no further! 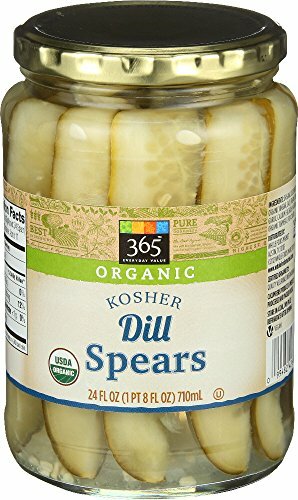 Drive a pickled stake through the heart of your hunger by dropping these bad boys on your favorite sandwich or appetizer plate. Nosferatu? More like Nomoreforyu, cos these tasty cukes will be gone in a heartbeat. 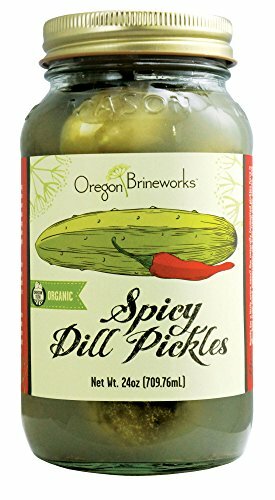 The folks from Oregon Brineworks are experts in the field of fermented vegetables. They really know how to keep the crunch in their cultured veggies while adding the perfect touch of complimentary spices to create their own unique, signature foods. We've waited over two years for culture pickles. It was well worth it! Important: There may be some leakage of juices during shipping in summer weather. This is due to the probiotic bacteria waking up and releasing some CO2. The lids are designed to allow some venting when needed rather than have the glass break from the built up pressure. If this happens the product is absolutely safe as the pressure only allows a one way movement, nothing comes in. Upon arrival we suggest to slightly turn the lid over a sink to vent any CO2 and then refrigerate. We can not accept returns or refund in these circumstances, so please do not order this listing if it is a concern. Must be refrigerated upon arrival. 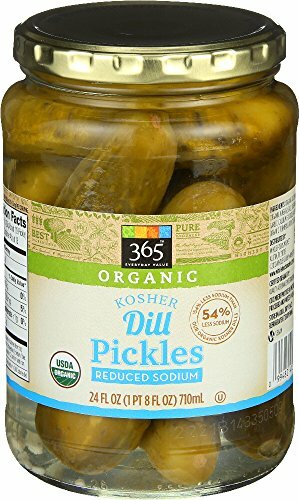 Crunchy organic baby dill pickles with the same zesty taste as the whole pickle! 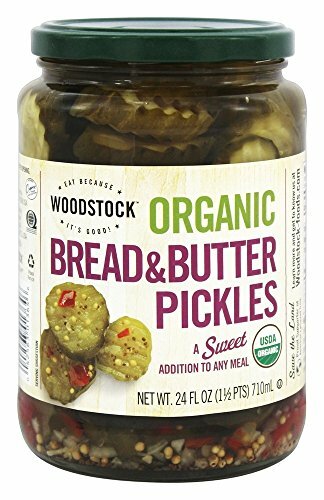 Woodstock Organic Kosher Baby Dill Pickles are great as a snack or with a meal. Woodstock Farms was created to honor the inseparable relationship between the vitality of the soil, the energy of plants, the taste of ripeness and the viability of farming. It has grown to an extensive line of organic and natural grocery, dairy, and frozen food products. Woodstock Farms products combine excellent quality and affordable prices. 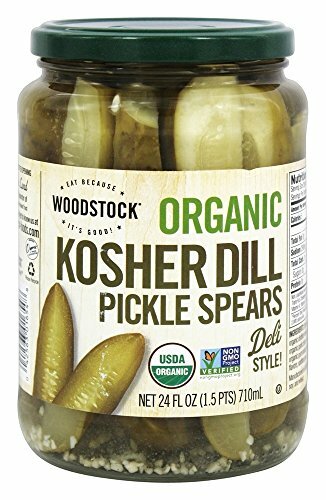 Woodstock® Organic Kosher Dill Pickle Spears.Deli style!Eat because it's good!USDA Organic.Non GMO project.Verified.nongmoproject.org. 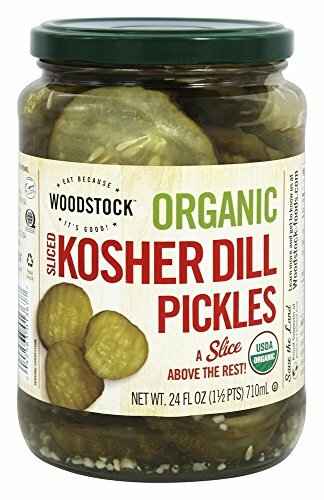 Copyright © Wholesalion.com 2019 - The Best Prices On Organic Pickles Online.